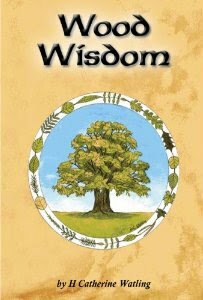 I'm currently reading a lovely book called Wood Wisdom. It is all about tree lore and has a wealth of information about the trees made famous in the ancient Irish Ogham tree alphabet. It is illustrated with mandala-like images for each tree, with circular patterns derived from the leaves, seeds, berries and symbolic associations. I must admit the book by H Catherine Watling has been on my to-read pile for a little while - I got it at the same time as The God Tree, which I wrote about at the end of last month - but I am really wishing I'd read it sooner because it is fascinating. Wood Wisdom begins with a guided meditation called Treading the Forest Path. This can be used to meet the sacred trees of our land, and the rest of the book covers the trees in detail. It offers facts as well as folklore, Celtic myths and legends, poetry, seasonal rituals, crafts such as wand-making and a meditational paragraph on each tree that can incorporated into the forest pathworking. The Capall Ban website says: "Wood Wisdom is designed as a companion to exploring the sacred forest, both in the physical world and the inner realm of imagination, vision and dream." As well as being a treasure trove of delightful information, the book acts as a divinatory set. A card set is being produced to accompany the book, so you can draw one and look up its meaning for guidance or inspiration. Although I haven't seen the card set, I can see from the illustrations in the book that it would be delightful to use. Jon of publisher Capall Ban told me: "The author is also the artist and is producing the cards as a separate colour set. Originally the book wasn't going to include the cards, but we're changing it to have the cards as a black-and-white set bound in the back. We'll supply b/w cards to people with the original version." I think this could well be the book I was looking for to help me explore the Ogham in greater depth, but I'm sure I'll also be taking it with me on woodland walks - as well as trying out the visualisations. And I look forward to hopefully seeing the cards some time too.